You’re invited to participate in Grace Center’s first church-wide outreach and serving opportunity! Join us on Saturday, March 16th as we partner with Papa Joe & Denise Bradford to host a picnic in the J.C. Napier community of Nashville. We're looking for volunteers to help facilitate this event as we serve hamburgers and hot dogs, play games with kids, offer prayer ministry and connect in community. We would love to have you as part of our team! Families with children are welcome to come join the fun too! This is a great opportunity for our entire church family to come together and serve our city as we love our neighbors. We are expectant as we partner with God to bring transformation to our city and beyond! 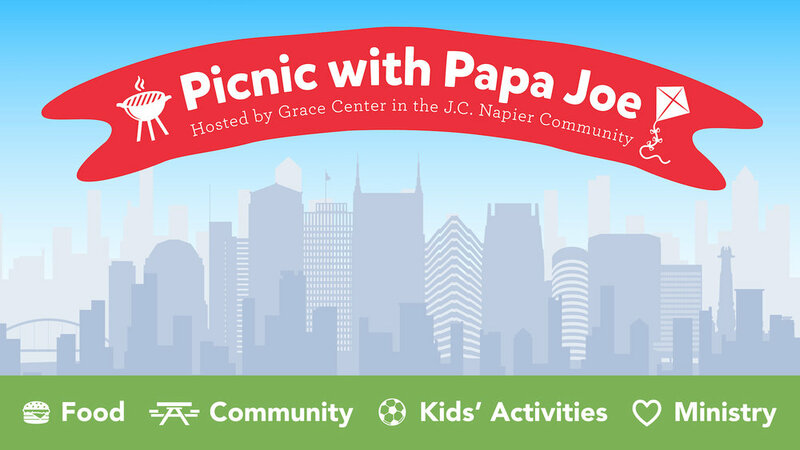 Click the button below to let us know if you are interesting in serving alongside our church family and Papa Joe at our picnic in the J.C. Napier Community on Saturday, March 16!